Students in the Advanced News Writing class explored how kind people are to each other day in and day out through a class project called Timeless Kindness. Last semester, Wright State’s Advanced News Writing class gave a name to poverty through “Who is Poverty,” a series of stories shining a light on poverty and the circumstances that lead to it in the Dayton area. This semester the focus is on acts of kindness. Ray Marcano, an instructor in the Department of Communication at Wright State, said the inspiration for writing about kindness came while he was watching the news. Timeless Kindness was almost entirely student-run, with students creating content for the project website, including videos and podcasts, editing an ebook and managing marketing and social media. They received help from Marcano and Ken Paxson, who has worked with Cox Media, as well as several other media companies. Student reporters wrote about local charity organizations, such as Shoes for the Shoeless, a nonprofit that distributes shoes to children in poverty; SICSA Pet Adoption Center; and Wright State organizations like the Friendship Food Pantry. Students also wrote about personal experiences and people in their community. For example, Tina Guindi, a student reporter in the class, moved to America from Egypt in 2013. Soon after she moved, she met Christine Rizk, who had also moved from Egypt a few years earlier. The two bonded quickly, and Rizk helped Guindi get settled into her life in the United States. To finish up the Timeless Kindness project, the class hosted a Facebook Live event in the Student Union. 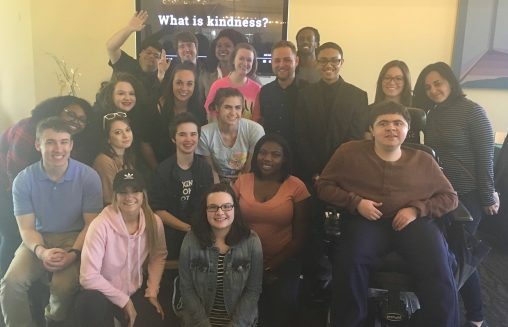 Michael Sells, the editor in chief for the project, and Richard Hairiston, editor of the e-book for the class, discussed kindness with several student reporters, as well as people in the community and around Wright State who embody kindness.